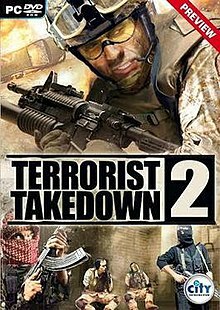 Terrorist Takedown 2 (also known as Terrorist Takedown 2: US Navy Seals or TT2) is a low-budget first-person shooter video game developed and published by City Interactive. The game uses the LithTech engine developed by Monolith Productions. ^ "Terrorist Takedown 2: US Navy Seals". Internet Movie Firearms Database. Retrieved 4 June 2018. ^ "Terrorist Takedown 2: US Navy Seals reviews". GameSpot. 13 June 2008. Retrieved 4 June 2018. This page was last edited on 10 August 2018, at 13:32 (UTC).